The Federal Motor Carrier Safety Administration (FMCSA) announced that it has extended the compliance date for its Bus Leasing and Interchange Final Rule until Jan. 1, 2018. On May 27, 2015, the FMCSA originally published in the Federal Register a Final Rule to identify motor carriers transporting passengers in interstate commerce and correctly assign responsibility to these entities for regulatory violations during inspections, compliance investigations and crash investigations. This Final Rule will also provide the general public with the means to identify the responsible motor carrier at the time transportation services are provided. The National Transportation Safety Board (NTSB) had recommended that FMCSA regulate the leasing of passenger carriers in much the same way as it regulates the leasing of for-hire property carriers. The original compliance date as set forth in the Final Rule was January 1, 2017. The one-year extension of the compliance date will allow FMCSA a sufficient opportunity to review and, where appropriate, make adjustments due to a number of petitions for reconsideration. For further information, see today’s Federal Register announcement here. 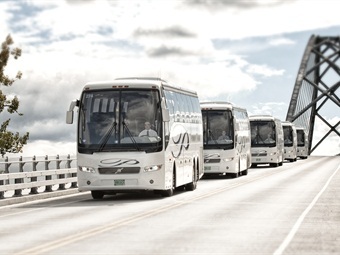 Each coach is powered by a Cummins engine with Allison transmission and includes a host of passenger conveniences.